Woven by hand on a backstrap loom, this heavenly blue table runner depicts the quetzal, Guatemala's emblematic bird. Its splendid plumage was prized by the ancient Maya, and the shy bird can still be glimpsed in the rainforest of Central America. 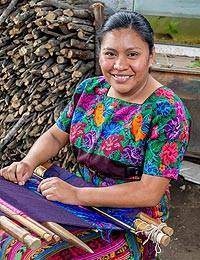 Mayra Leticia Hernandez shares her textile expertise and love of colors with this beautiful weaving.